Spent a while today working out the best procedure to create a USB Key boot DOS, without a Floppy Drive. Below are the instructions and files that worked for me, haven’t gone into to much detail, but feel free to ask any questions in the comments section below. !!Warning!! This procedure will delete all files from the USB key, make sure you backup all data! 3. 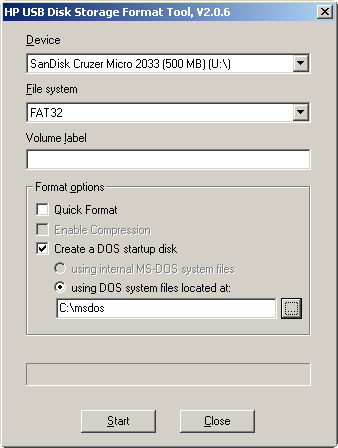 Ensure you have the right USB device selected, and check ‘Create a DOS startup disk’ also putting the location of the contents of msdos.zip in the field below. 4. Click Start and then your done! To test, make sure your Computer supports USB booting, plug in the USB key and reboot. You should end up with a DOS prompt. Enjoy! Thanks dude, I had looked down the Linux on USB path but I needed DOS for a BIOS update.